THE ADVENTURE CONTINUES WITH R2CL! Welcome to the R2CL part of the website. The first year was disapointing with a DNF at Oschersleben, only 2 points at Suzuka after a crash and early crashes in the two 24 hour races costing us lots of the bizarre bonus points that were introduced for 2014. It seems quite bizarre to me to reward failure to finish two 24hour races with up to 40 points (more than you can get for winning an 8 hour race!) - not to mention being competely contrary to the spirit of Endurance. 2015 was even worse with DNFs in both 24 hour races, a poor race at Oschersleben due to Vladimir Leonov not turning up and just outside the points at Suzuka. But for 2016 things improved on track and despite being totally financially shafted by the organisation shake up to the extent that we were unable to contest 25% of the races we still finished 9th in the championship due to a fabulous 4th place at Le Mans and 2nd of the EWC teams at Suzuka! For those wondering what R2CL means errdersayel does not cunningly make up a French word, it is just the initials of the first names of the 4 most important people involved in founding the team, the R being for Raph, the original team manager (now deceased). One of the two C's is Cyril, the new team manager. Or is it 2 R's? L=Louis. For more direct news from the team see the R2CL website. This site is about an insiders perspective from a technical viewpoint so if you want to find out more about the series, tracks, riders, results etc please go to www.fim-live.com. If you want to find out what it's like to dive straight in at the deep end and do something completely different then the Phase One part of Mike's Endurance may be more helpful, if you want to read a blog telling what it is like to be in the pit for the top private team in the World Championship taking on the factory teams then please read on and explore the site. Be careful though - you may be tempted to give it a go yourself and end up spending lots of money. I accept no responsibility if that happens! The 2016/17 season was one where we, along with other mid-ranking teams, were never going to be able to replace the funding that was removed by the championship organisers that is required to continue at that level. Therefore the plan was to use what money there was to make a decent effort at the 3 big races at least, develop the new Suzuki GSXR1000 and not properly contest the championship, hoping to form a base from which it would be possible to mount a decent challenge to the championship in 2017/18. 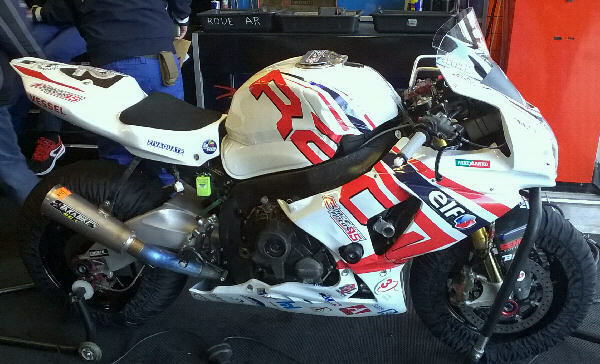 Unfortunately we had rider problems at the Bol d'Or and development problems at Le Mans, followed by the tragic death of Team Manager Raph in a road accident just before Suzuka. Raph was the driving force behind R2CL and did almost all the work that is required for a team to arrive at the track with competitive bikes, riders, equipment and funding so there seemed little real prospect of the team continuing long term without him. However, our very good friends in the Japanese Modeler GP club suddenly found a cash sponsor willing to provide sufficient funds to pay for much of the technical work Raph used to do. This has enabled the team to continue, but only contesting the major races where the sponsor wishes to promote their Sun Chlorella brand name. This has resulted in an entry to the 2019 Daytona 200, a completely new experience for the team. This is not an official website of anybody and the content does not reflect the views or policies of the R2CL, Suzuki, BAE Systems, or even Phase One, just me. Racing motorcycles can be dangerous but they do not form any part of the UK military deterrent or the Defence Industrial Strategy. Everything in here is my copyright unless otherwise stated or it's something about someone in the team that they don't like in which case it was done by an Ex-SAS bloke I know who will be back from body-guarding in Kabul next week and happy to discuss it in the alley behind the Prizefighters Arms in Bristol Docks. All manufacturers logos and trademarks are acknowledged, particularly the ones that show a bit of decent design skill. I'm rather partial to the Fedex one myself (with the arrow hidden in it) but they don't sponsor anyone as far as I know so pretend I didn't mention them. Forget they exist and do not under any circumstances try to find the arrow. The site is censored and welcomes censorship requests from anyone who's paying money that helps make the whole experience possible. I would censor all the bits where something I made broke, but I can't afford it! I accept no responsibility for financial liability incurred by anyone who thinks this looks so good he wants to have a go. All reference to the male gender (he, his, him, etc) shall be taken to mean he/she, his/hers, him/her, etc, as appropriate, except where it clearly refers to an image of a transvestite or transsexual in which case you can take it to mean anything you like. The previous sentence should not be taken as an indication that there might or might not be any such people involved in EWC or that anyone would care if there were. All images of scantily clad persons are on the site are there purely to inform what it was like and you won't see anything that wasn't on show in broad public daylight. This is entirely the fault of the site fan who described the site as the only true historical record of what it's really like to be in the EWC. I did not go to bed with them, buy them a drink, slip them a business card or even look lustfully at their chests or wink. Any suggestion that anyone or any company has paid me anything or given me any goods in exchange for preferential coverage on the site is a scurrilous lie. Unfortunately. Please get in contact if you would like to rectify this problem!